The interest of the Brazilian di Cavalcanti for art starts with the intellectuals that gathered in his father’s house. The artist, self-declared communist and nationalist, constantly tried to develop and art free from European influences. Plainly Brazilian. However, his first exhibition was influenced by symbolism, expressionism and impressionism, movements he have been in touch with during his first stay in France. After a period in Brazil, di Cavalcanti returns to France, which exalted even more his nationalism and resolves him to continue searching for a purely Brazilian art. So, in his paintings, he starts to work typical motifs of his country: mulatto women, carnivals, black people, desert alleys and tropical landscapes; all elements that couldn’t be found in European painting. Despite his serious political commitment, di Cavalcanti doesn’t paint any ideology, on the contrary or the Mexican muralists such as Diego Rivera and David Alfaro Siqueiros; but he only portrays everyday life scenes, including women always in his canvases. 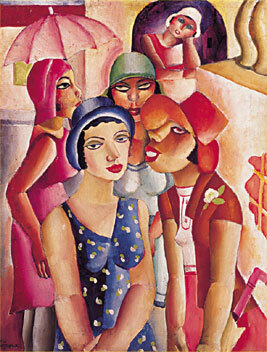 Five girls from Guaratinguetá is a clear example of the late work of the artist. In it, we see 5 high-class Brazilian women, wearing makeup and European clothes, but keeping their local features, such as their slightly brown skin, their full lips and their curvy bodies. And that’s how, di Cavalcanti, despite the style he uses, portrays 5 local women dress in European fashion, accepting and denying at the same time the influence of the old continent in his country. ~ by Álvaro Mazzino on December 21, 2010. If you can’t find something to lust over here, you likely just aren’t meant to be a Chanel fan in this life. Enjoy all the photos below – these bags will hit stores at the end of the year. This entry was posted on December 21, 2010 at 09:25 and is filed under Art nouveau, Cubism.You can follow any responses to this entry through the RSS 2.0 feed.You can leave a response, or trackback from your own site.